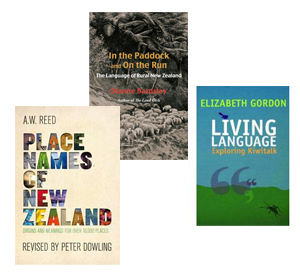 Living Language: Exploring Kiwitalk, by Elizabeth Gordon (Canterbury University press, 2010), 256 pp., $35.00; In the Paddock and on the Run, by Dianne Bardsley (Otago University Press, 2010) 464 pp, $50.00; Place Names of New Zealand, by A.W. Reed, revised by Peter Dowling (Raupo Books, 2010) 502 pp., $50.00. Within a decade or two of their first arrival in New Zealand, English-speaking settlers began to note the changes wrought upon their native tongue by their experiences in a new environment – and their descendants have been gleefully analysing the development of New Zealand English ever since. Elizabeth Gordon’s Living Language: Exploring Kiwitalk and Dianne Bardsley’s In the Paddock and on the Run are recent additions to the pantheon, while A.W. Reed’s Place Names of New Zealand has recently appeared in a new enlarged edition revised by Peter Dowling. Many years ago I was lunching with Professor Ian Gordon of Victoria University, who at the time was helping to compile a New Zealand edition of the Collins English Dictionary. ‘The language of all the English-speaking peoples,’ he declared, ‘is moving in the direction of New Zealand English.’ I was stunned and delighted by this bold statement, as I had always been taught that the colourful local words we brought to school represented a corruption of the King’s English and should be exorcised at all costs. I recall submitting a story in which I wrote ‘cow bail’, only to have it corrected to ‘cow byre’ by my English teacher. Is there any local sharemilker (now there’s a fine Kiwi word) who has ever used the word ‘byre’? These recollections came to mind as I took up Elizabeth Gordon’s Living Language: Exploring Kiwitalk, for the author, a former lecturer in English and Linguistics at the University of Canterbury, is refreshingly free from the heavy load of prejudices carried by so many of us when we discuss the use and abuse of our beloved English language. The book gets off to a slightly unfortunate start for a wordsmith, with an unnecessary little verb floating freely in the fourth line of the Introduction, but after that Gordon treats us to a thoroughly enjoyable and quirky wander through the idiosyncrasies of our version of the world’s most widely-spoken tongue. Gordon uses personal experience to illustrate the changes that are taking place in the New Zealand vernacular, a technique that happily removes any lingering flavour of academia. She also ranges far and wide, as befits a book of newspaper columns, with some of my favourites, such as ‘Hokey-pokey hanky-panky’, having little to with Kiwitalk at all. But for all lovers of language this book makes for pleasant bedside browsing. It has certainly dented some of my fusty prejudices, even if it has failed to eliminate them altogether. As someone brought up on a sheep farm I found In the Paddock and On the Run particularly enjoyable. Dianne Bardsley, as befits the Director of the New Zealand Dictionary Centre at Victoria University, has written a thoroughly academic work, with every entry scrupulously annotated with historical citations. But such is the rich diversity of the bucolic words and phrases she has collected that even the most carefree dipper can find a gem on almost every page. The introductory section of the book appears somewhat cramped, but there are some fine illustrations, and I was immediately captivated by the chapter listings, which are delightfully rumbustious for what purports to be an academic dictionary. They range from ‘Aggies, Baggies, and Grubbing Gangs (Roles and identities), through ‘Hokonuis, Hermits and Halo Hairs’ (Sheep and their husbandry), to ‘Quintessentially No. 8 (Adaptations, Innovations, Pests and Diseases’. These immediately impart the flavour of the book, and from then on in my case it was just a matter of dipping joyfully, finding words that I had never encountered before. I discovered to my surprise that the South Canterbury downlands where I lived as a child are described as downy country, and I loved the definition ‘career girl’ – a ewe that refuses to accept and feed her lamb, — and ‘nudists’ as a description of shorn sheep. Some of Bardsley’s introductory comments are particularly illuminating. She notes how New Zealand farmers have from the very early days identified entirely with their land and their stock, quoting Samuel Butler in the 1860s: ‘I was rather startled at hearing one gentleman ask another whether he meant to wash this year, and received the answer “No”. I soon discovered that his sheep are himself. If his sheep are clean, he is clean.’ And a description of a Manawatu farmer in 2004: ‘Farming at 300 metres above sea level, he is a late lamber.’ She also cites examples of rural words and phrases that have entered the wider New Zealand vernacular, such as ‘crack your whip’, ‘drag the chain’, or ‘flat to the boards’. Like Elizabeth Gordon in a more general context, Bardsley provides interesting evidence of the influence of Maori words on our rural language. From the earliest days of colonial settlement these were bastardised, so ‘piripiri’ became ‘bidi-bidi’, ‘tumatakuru’ ‘matagouri’, and ‘tutu’ ‘toot’. Incidentally, I found it interesting that in her introduction she used the words ‘te reo’ in her running text with no attempt at definition. She is right to do so, although less than 10 years ago this would have been puzzling to the majority of pakeha New Zealanders. As might be expected the language of sheepdogs in the chapter entitled ‘Huntaways, Hoolers, and Half-day Dogs’ is particularly colourful. I liked the contemptuous ‘powder puff’ – a light, noisy dog; ‘shandygaff’, a cross between a huntaway and a heading dog, or ‘shingle-scratcher’ – a dog that makes a lot of noise but achieves little. I have a suspicion that with the increased mechanisation of modern farming, many of the words and phrases so laboriously collected by Bardsley for this compilation have already disappeared from the farmer’s daily lexicon. Whether this is true or not, we owe the author a debt of gratitude for collecting and annotating so minutely New Zealand’s rich heritage of rural language. I was working as an editor at A.H. & A.W. Reed in 1975, when A.W., as he was always called in the company (his uncle, A.H. Reed, was known as The Founder) quietly dropped on my desk a voluminous manuscript that later became the first edition of Place Names of New Zealand. It was always thus: A.W. would spend most of his days dealing with the multifarious matters associated with running a large publishing house, then two or three times a year submit yet another manuscript for consideration. We assumed that he seldom paused to eat and obviously never slept. In the case of Place Names, he had spent years collating and describing the names of our towns, settlements and geographical features, exploiting the resources of his vast library in his Wellington house. The book, as wily old A.W. already knew, became a bestseller, and he updated it before he died in 1979. A further edition, entitled The Reed Dictionary of New Zealand Place Names, was published in 2002 before this edition was published by Penguin in 2010, radically revised and enlarged by Peter Dowling, who thoroughly deserves to be named as a co-author of the work. I am not clear whether people from other countries share our passionate interest in the words and names unique to our own environment. When I lived in England for a number of years, ‘the natives’ (read Elizabeth Gordon on that incendiary word) never evinced much interest in the rich history associated with the place names of their country, whereas here you can always stimulate a healthy discussion if you mention Whanganui or even Aoraki-Mt Cook. Perhaps this reflects the need for a young society to identify and root itself in its environment, but for whatever reason, this latest edition of Place Names of New Zealand can be expected to sell even more successfully than its predecessors. The origin and meaning of New Zealand Place Names are of course what the book is all about. Not only do we want to know the meaning of the vast array of Maori place names in the pantheon, but also their origins and those of the European names bestowed upon our landmarks over the past two centuries. Dowling has added another 1500 entries to Reed’s most recent lists, bringing the total to over 10,000, and has revised and edited them to create a more disciplined and authoritative work. What I found particularly intriguing were the original Maori names for those places renamed during the nineteenth century. One is told these days that the publishing industry is experiencing hard times. It is encouraging to know that books such as Living Language continue to be published, and it is to be hoped that valuable reference works such as In the Paddock and on the Run and Place Names of New Zealand will always be available for scholars and general readers like. DAVID ELWORTHY grew up on a South Canterbury farm; he published his first poems in Landfall in 1954. In 1984 he and his wife Ros Henry founded Shoal Bay Press, which they ran successfully until they sold the company to Longacre Press in 2004. He and Ros are the authors of the recently-published Edward’s Legacy: The Elworthys of South Canterbury.